VILLAS AND APARTMENTS TO RENT IN COSTALITA, SPAIN. 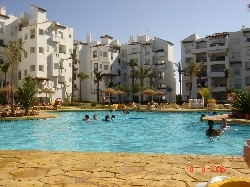 Welcome to our selection of holiday homes to rent in Costalita, Spain. Costalita is a purpose-built resort on the Costa del Sol, located close to the older town of Estepona. Although the accommodation available is mainly private homes and apartments, many with their own pools and sea views, there is one hotel in Costalita and it is possible to rent the private residences on a holiday rental basis. Whether you are staying in the hotel or in a private home, you are never more than a few minutes walk from the Costalita beach and there are pools everywhere throughout the complex to help you relax, unwind and enjoy the Costa del Sol sunshine. The hotel has children's club and organises evening entertainment, which other Costalita guests are welcome to enjoy too. The Villa Padierna Country and Racket Club is located right next to the hotel and offers tennis courts, lessons and competitions for both adults and children. You can ever hire equipment if you don't want to pack your own. There are two beach bars which serve drinks and snacks during the day and into the night; La Antigua is the posher of the two and is more expensive, serving full meals as well as drinks, while Pepes Beach is more relaxed and is a great place to grab a snack after a long day sunbathing on the sands. As with many parts of the Costa del Sol, Costalita is well served by golf courses with several located within driving distance. Los Flamingos Golf is one of the closest and also one of the best known in the region. Consisting of three 18-hole golf courses, Los Flamingos has been the venue for some prestigious competitions, such as the European Senior's Matchplay. If golf isn't your thing, then the typically Spanish village of Cancelada is only a short walk away from Costalita, while the nearest town, San Pedro, is only a few minutes away by car. This is the closest place where you can find services such as banks and post offices as well as larger supermarkets if you are self catering. For a more glamorous trip, the marina of Puerto Banus is about five minutes by car or taxi if you want a night out mixing with the rich and famous! This is the closest place to Costalita where you can party in bars or nightclubs, and taxi fares back to the resort are quite reasonable, even in the early hours of the morning. Puerto Banus is also the place to go if you want to do some shopping or perhaps just some window shopping considering the designer labels and prices that are on offer here. Looking for self catering holiday accommodation in Costalita? Then below is a selection of holiday villas in Costalita and holiday apartments in Costalita that can be rented direct from their owners. You can either click on each listing for further details or you can use our search engine on the left if you are looking for something in particular.